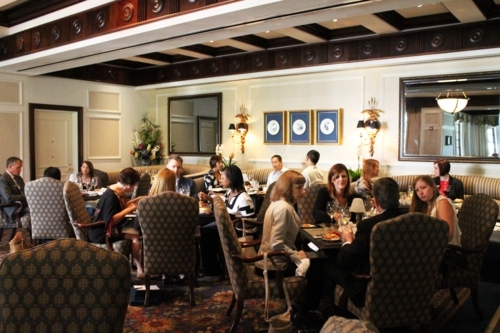 As you may recall, I was invited to try the spring menu at the Fairview Dining Room last March. Last Thursday, I previewed the fall menu along with several other local food bloggers and media members at a complimentary lunch. And it was amazing. Chef Jason Cunningham’s cuisine continues to prove to me time and time again that it’s one of the best in the area. 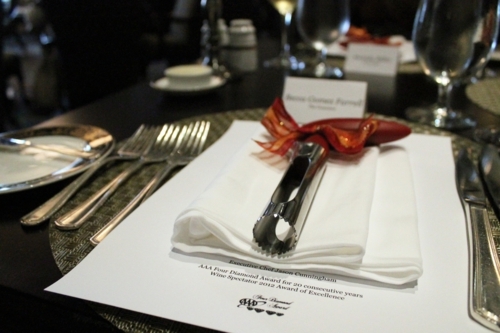 The place setting along with an apple corer gift. This event not only showed off his fall menu but also highlighted the new, more casual feel for the Fairview Dining Room itself. Noticing the trend toward gourmet eating without the gourmet pretension, the Fairview has dialed down the dress requirements and done away with white tablecloths. They’ve added some new curved booths and televisions that are masked as mirrors unless a Duke game is underway. 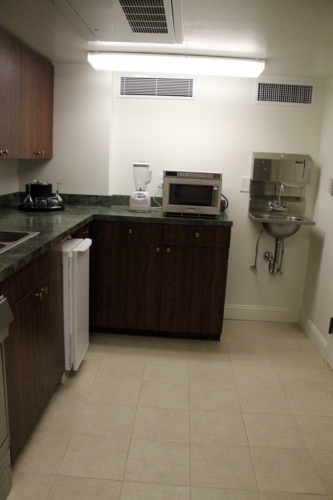 You can see those mirrors along the wall in that picture. 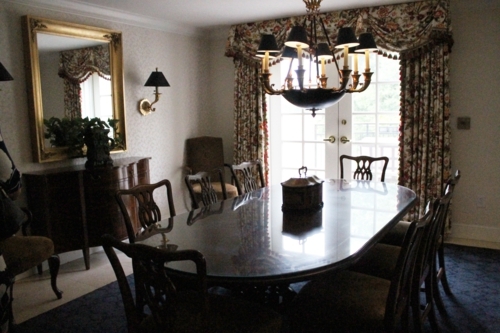 Other decorations include Wedgewood decorative plates depicting scenes from Duke, cherry finishes on the tables and chairs, and a new presidential terrace event space with a fireplace. I’m not sure that the Fairview Dining Room atmosphere felt much different to me on this visit, but I definitely appreciate leaving off the white tablecloths. I always find them so unimaginative. Color is essential! And color there was a-plenty. Our meal was an array of samples from the full menu, so these portion sizes are smaller than you would normally get, but believe me when I say they were plenty large for us. 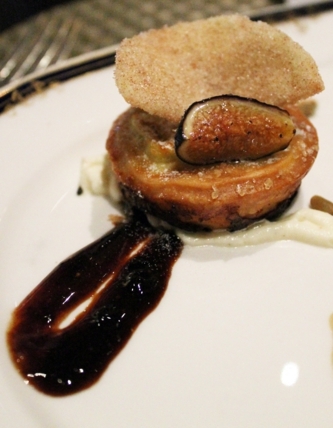 The menu was divided into fall-themed sensations, and the first course was entitled Rustling. The presentation was gorgeous. 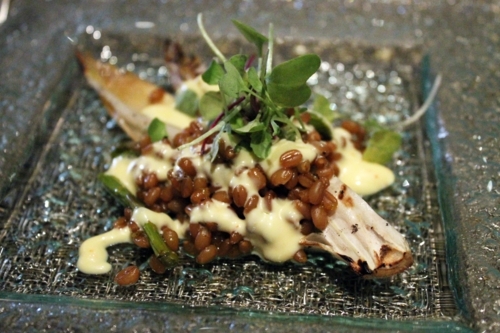 It was grilled Belgian endive with orange-roasted asparagus, wheat berries, and vanilla lemongrass aioli. It was also my favorite of all the dishes, which is often the case for appetizers. I’ll start with the critique, which is only that they overdid the amount of aioli. But who could blame them? It provided a rich, fatty sauce with delicate flavors from the vanilla and lemongrass that combined so well with the charred bitterness of the endive and the toasty quality of the wheat berries. The presence of orange was the perfect ending note to the dish. 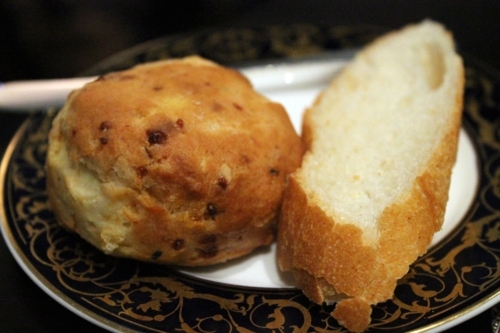 Bread service included cheddar cheese biscuits and baguette slices that were pretty standard fare. I like my cheese biscuits fluffier, but that may be because of my couple of months as a Red Lobster waitress. The next course was Brisk, which featured an autumn salad with roasted apples, Elodie Farms manchego goat cheese, spiced walnuts, dried cranberries, cornbread croutons, and sherry walnut vinaigrette along with a bourbon rabbit confit. Somehow, I managed to delete my picture of the salad, but it was good, especially the tartness of the roasted apple in combination with the cheese. The cornbread crouton made me worry about how fast they’d go stale rather than enjoy them—yes, sometimes I have odd reactions to texture. 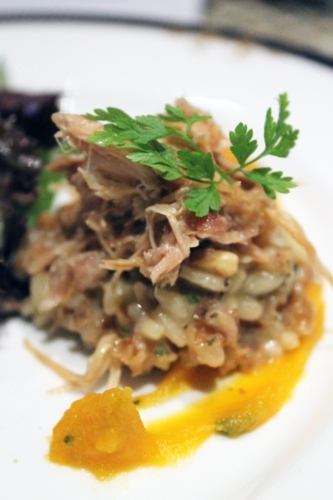 The bourbon rabbit confit was served over barley risotto with pine nuts and a pumpkin and butternut squash risotto. This was also a great dish, and I felt like the subtle differences in the squashes made it quite lively. I think white pepper came into play there as well. 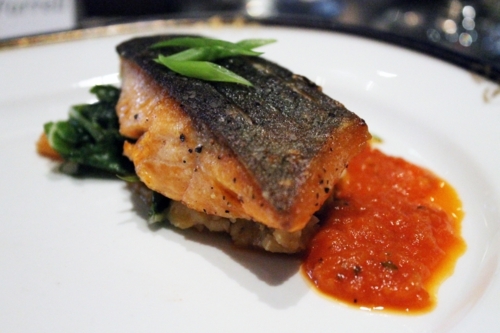 The next course, Crisp & Crackling, featured pan-seared Arctic char and braised beef short ribs. First, the colors were amazing: bold greens, reds, and oranges combined with the smoky greyness of the fish skin. The skin was the best part of the dish. It was so crisp, had the texture of bacon, and was wonderfully seasoned. Many times I avoid fish skin, but cooked like this, it would be a crime to. The smoky tomato jus was bold, and the spices from the sweet potato infused the dish nicely. 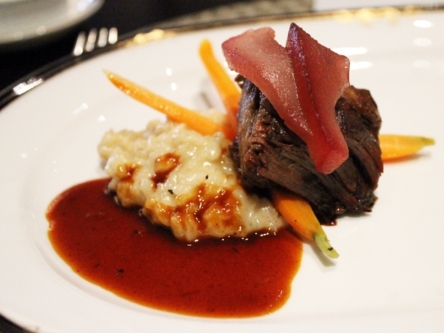 It was a popping presentation for the short ribs with blue cheese risotto, Hillsborough honey-glazed carrots, and pear-peppercorn veal reduction sauce. I generally avoid veal—haven’t quite worked out my moral stance on it yet—but I can’t deny how savory that sauce was. The blue cheese came out strong in the risotto but avoided pungency, and the tender beef combined very well with a bite of everything. The only drawback was that the baby carrots were undercooked. Finally, it was time for Cozy, a lovely name for fall desserts. We were spoiled with three samples for this course. I’ll start with my least favorite, the apple custard tart. It was my least favorite mainly because it felt like too heavy of a meal ender. I loved the flavors and sourness of the apple cider fig castrique, but I think the dessert would be better if it were more of a brulee rather than just a smidge of mission fig brulee in a dense pastry shell topped with a churro-like wafer. Too much bread for me. 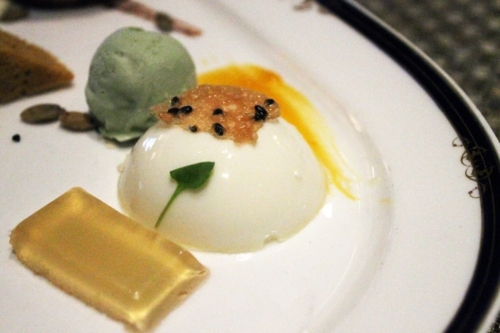 In direct contrast with that was the white chocolate sesame panna cotta with green tea ice cream, yuzu gelee, mango coulis, sesame tuille, and leaf of micro shiso. One of my dining companions, the lovely Amanda of Victus Populi, adored this one. It did not work quite as well for me, but I enjoyed its overall lightness. Using sesame throughout was creative and balancing, and the pastiness of the green tea ice cream made for a great sauce as it melted. 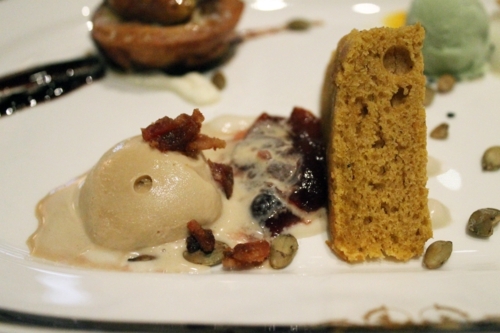 It was the warm sweet potato cake with cranberry compote, maple ice cream, bourbon sabayon, candied bacon, and pumpkin seeds that stole my dessert-loving heart. I occasionally tire of the Bacon on Everything! trend, but that small sprinkling was just right for making the maple sweeter in contrast. The warm, soft cake soaked the ice cream right up, and the tartness from the cranberries and sabayon give it all a good kick. Another fabulous meal from the Fairview Dining Room and Chef Cunningham. But we weren’t done yet! 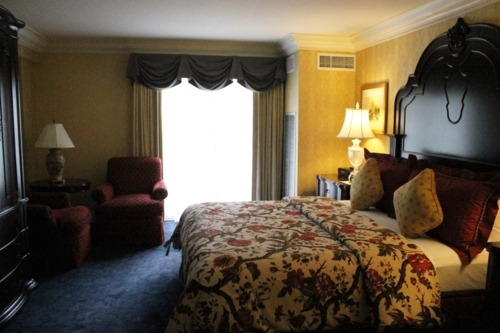 Turned out that the Washington Duke Inn also has a special promotion on, which resulted in an opportunity to take a tour of their presidential suite! Who would say no to that chance? Not I, dear reader, not I. 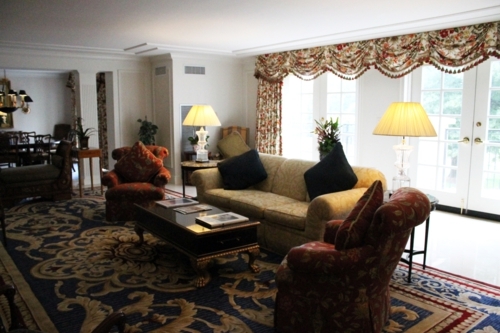 Normally upwards of $2500 per night, the presidential suite is on a presidential sale through November in honor of the election season. The price? 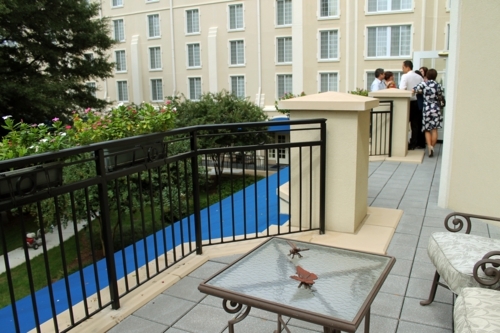 $2012 per night, of course! 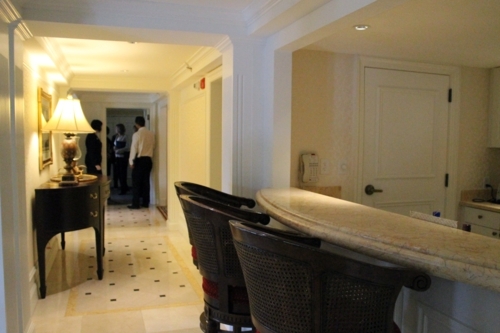 Here are a few photos of the suite. 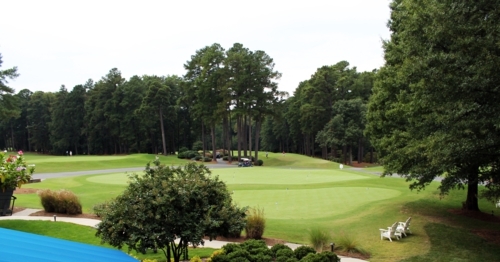 View of the golf course from the balcony. Bar area and entry hall. If that’s your style, then this is the time to take them up on the sale. Also, it’s time we get to know each other a little better, hint hint. A girl can’t live on complimentary media lunches alone! Just don’t tell my husband. Thank you, once again, to the lovely staff of the Washington Duke Inn for the great conversation while trying Chef Cunningham’s delicious food and the opportunity to do so. This food blogger’s stomach is very grateful.